The construction of Hyvinkää Airfield began during the Temporary Peace. Hyvinkää had been bombed eighteen times during the Winter War, with 270 buildings suffering damage, ten of which had burned down. Six people had been killed and seventeen injured. That wasn't the main reason for locating the airbase in Hyvinkää. 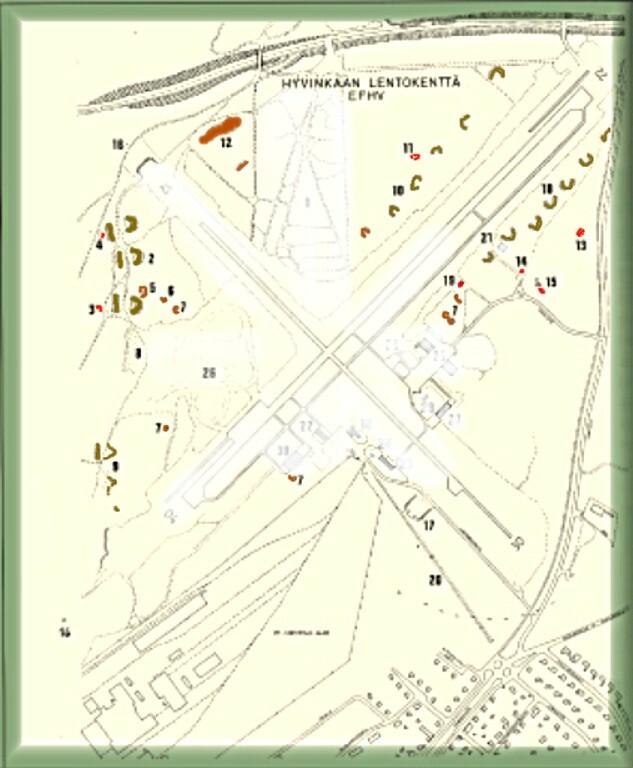 Erkylänkangas at Hyvinkää was practically made for an airfield. At the late period of the Ice Age, over the course of 200 years, streams of melting water brought massive amounts of soil to the region. At Erkylänkangas, the massing land reached the surface level of the sea, and the waves smoothed the area. So the place was suitable for an airfield. There were similar areas elsewhere, too, but Hyvinkää had one advantage: by placing the base there, the important railroad crossings at Hyvinkää and Riihimäki could be protected, while it could also be used in the defence of Helsinki. The job of building the airfield was given to the National Road Administration. The work began in 1940, during the Temporary Peace, and the workforce consisted of duty-bound workers unsuitable for the war front. A team of Estonian volunteers also took part. 70 horses and a cannon tractor helped in the work. Trees were felled by tractor pulling, roots were cut and undergrowth burned. Runways were levelled with sand. The finished work was inspected on August 30th, 1940. By that time, the work had cost 4.7 million Marks. Improvement of the field was continued during the Continuation War. According to legend, the first plane to land at Hyvinkää was a Bristol Blenheim. The crew had gone AWOL, and they landed on the field to ask for fuel. The story doesn't tell if the runaways were caught. The memorial stone of the field's first casualty is near a small bog, on the NE side of the field. It was Hyvinkää-born Osmo Meriluoto, who had been practising dive rolls and immelmanns with the VL Pyry trainer VL-3 on June 15th, 1941. Meriluoto began an unsuccessful inverted dive at 500 meters, the plane hit the bog and sunk up to its tail. The pilot was killed instantly. 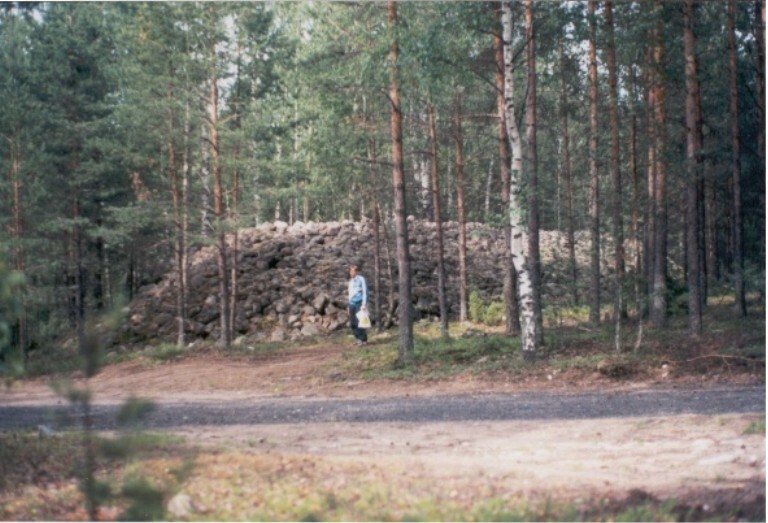 Meriluoto is buried in the so-called railway men's cemetery in the centre of Hyvinkää. The break of the Continuation War was observed with confusion at Hyvinkää. At the night of June 22nd, '41, people were awoken by the noise of bomber planes. German planes participating in Operation Barbarossa flew through Finnish airspace to bombard Leningrad and the airbase at Suurmerijoki, their route being Utö - Nauvo - Salo - Hyvinkää - Kouvola - Lappeenranta - Viipuri - Leningrad. The same happened also the following night. During the return flight, a Junkers JU-88 landed at Hyvinkää airfield. In June, the Fokkers of LLv32 had been transferred to Hyvinkää. The fleet strength was 292 men and its commander was Captain Erkki Heinilä. In the morning of June 25th, the Fokker flight on standby was called. A large formation of DB-3 was approaching from south, its target apparently being the railway system at Riihimäki. Seven Fokkers met the bombers near Kerava. The Russians turned tail right away, but Lt Veikko Evinen's FR-116 got to fire at two enemy planes. One fell at Malmi and the other in the Gulf of Finland. According to some sources, these were the first air combat victories of the Continuation War! Several alarms followed, but the dust clouds kicked up by the fighters in take-off made bombers turn away even before the defenders got properly air under their wings. On July 2nd, the LLv32 was moved away from Hyvinkää. It was supposed to be replaced by a Hurricane flight from LLv30, but that one was relocated to SE Finland. According to the field chronicles, the two victories were the only ones gained by planes from Hyvinkää. Nonetheless, on July 3rd, '41, the LLv30 HQ and a Fokker flight was transferred to the field. The other flight operated from Malmi, which was closer to Helsinki and the front at sea. Hyvinkää was the main base. The planes at Malmi gained several victories. Some of these missions may have been flown from Hyvinkää as well. Part 3b of the Finnish Air Force Chronicle mentions that on August 10, Lt Koskenranta's wing of the 2nd Flight destroyed two float planes near Naissaari. Two days later, four Fokkers from the 2nd Flight were taken to Pori and returned to Hyvinkää. This gives a reason to assume that the planes operated from Hyvinkää, not only Malmi. On September 1st, the fleet HQ and the planes were moved to Utti. 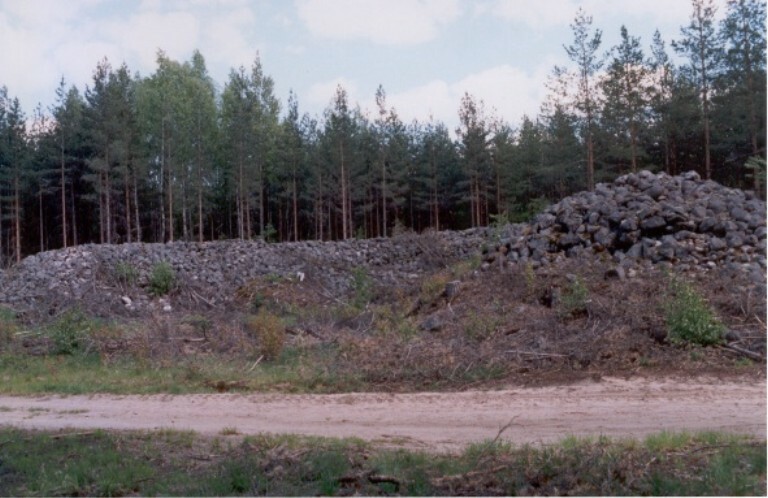 Closer to the end of the war, Hyvinkää was a reserve field. Hasse Wind, for example, flew his first flights with a military plane there, trying out the Fokker D XXI fighter. The field was used for training during the Continuation War, which can be seen in the number of wrecked planes. Click for larger resolution picture. Middle & right: The same shield before and after cutting the trees. This was one of the covered halls, that the base had at least five. 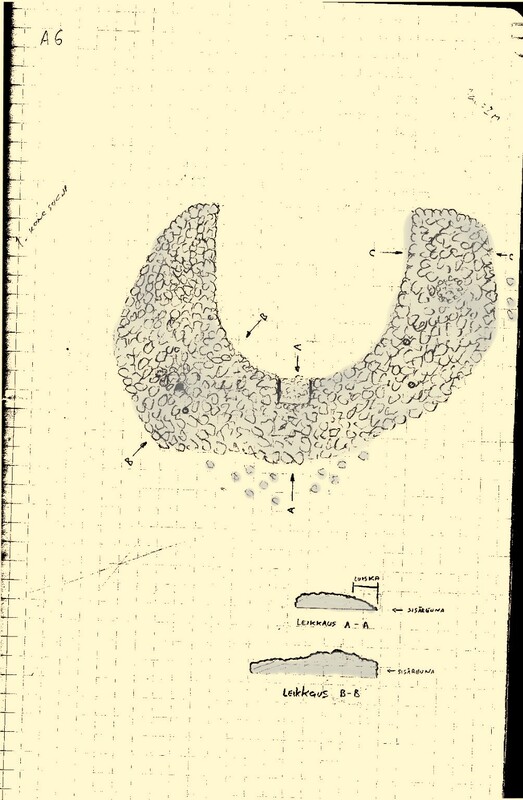 It is the lowermost of the three (marked with "2") in the map below, between objects #3 and #5. After the armistice, the Messerschmitts of HLeLv 30 were taken to Hyvinkää for the autumn. The fleet was disbanded in November and the planes were scattered to other fleets. On November 23, '44, two planes were wrecked at Hyvinkää. The Myrsky My-15 did a belly landing due to damaged undercarriage, and the Junkers W34 JU-134 failed its take-off because of ice in the wings and hit phone lines. The pilot, Major Hassinen, was not injured. Brewsters operated from Hyvinkää as well. Air Force had seven planes on 1945-46, and they flew from Hyvinkää and Malmi. BW-353 did a forced landing in the Paavola region, having run out of fuel. Those who know Hyvinkää can imagine what went on in the pilot's mind, the field was practically next door. In 1948, a Blenheim was damaged in landing at Hyvinkää, and the BW-373 did a forced landing at Riihimäki, again out of fuel. Also opposing planes landed at Hyvinkää. On autumn 1944, four LA-5 fighters took off from Pori on a surveillance mission. The planes got lost in poor weather. Two went missing, one did a forced landing in Lake Urjalanjärvi, and the sole remaining plane landed at Hyvinkää. After the war, Hyvinkää airfield was the main airfield in Finland for a while, when Malmi was assigned to the Allied Watch Commission. Later, motor and sailplane pilots have actively used the field. Every now and then, the Air Force and the Army helicopters have used the field in their exercises. Two of the runways have grown over after the war, but two still remain. The old runways are visible when you know what to look for, especially from the air. The plane shelters are marked with olive green, personnel shelters and AA sites with brown. Buildings are red. The wartime runways are roughly sketched white over the new mapsheet, structures built after the war are faded. Building #19 (above #7) used to be the flight control center, similar to the one at Kymi. The building is still standing. Based on a current map of the area. This page features the article History of the Hyvinkää Airfield.